The Saniflo Sanicompact 48/C4 is a self contained system that is used to install a half-bathroom up to 9 feet below the sewer line, or up to 100 feet away from a soil stack. The Saniflo Sanicompact 48 can handle the effluent from a toilet and sink and is quite simple to install, check out the video below for a look. For customers who want a more modern look for their half bath. The Saniflo Sanicompact 48/C4 needs no toilet tank as the flushing action and macerating pump cycle is automatic after pressing a push button on top of the bowl. The Sanicompact's flushing mechanism is electrically timed to allow approximately 1 gallon of water to pass through the toilet. The Saniflo Sanicompact 48 is a forced main and does not need to be vented and connected to a vent stack. Other fixtures may need to be vented as per local plumbing codes. It is also highly recommended for the macerator/pump to be connected to a Ground Fault Interrupter (GFI) circuit. 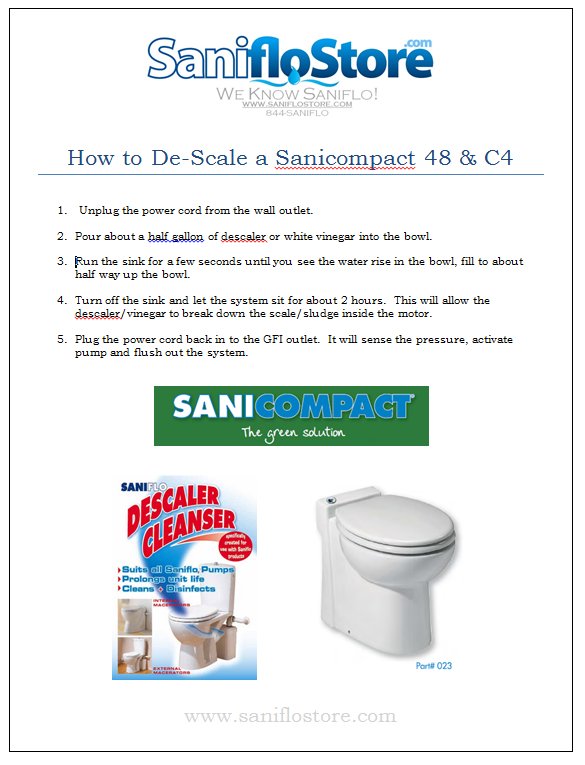 Learn how to maintain your Saniflo Sanicompact 48 or C4.